IVF procedure in India adopts the best infertility treatment which thus flourishes with the highest success rate ever known. IVF (In Vitro Fertilization) is a lab-based technique of assisted fertilization for the couples having in pregnancy. For a treatment to be successful, we assure and search for all the possible new techniques over the world. With the increasing technique and methodology, the centre boosts up for the excellence in the treatment. IVF procedure in India is the best, easiest and simplest procedure for the couples finding trouble to conceive. 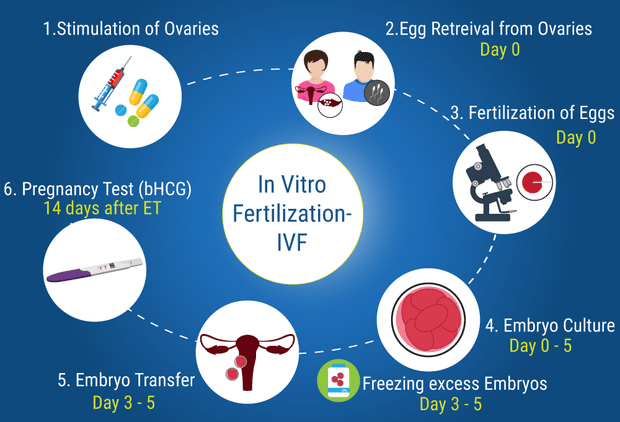 IVF procedure follows with the technique of fertilization is a test tube in the lab and the embryo formed is implanted to a healthy uterus for either your own one or on hire. The patients after they get to know about the risk come in a problem but the patient should feel confident about the treatment which will secure the treatments result. How to follow the procedure in a best possible way to avoid complications? Before the scheduling females are kept on birth control pills. The pills increase the rate of success thereby reducing the risk of ovarian stimulation. On the first day of your period the doctor will start blood test and ultrasound for the female. After securing all the results, ovarian stimulation procedure is started. Several medicines along with injections are prescribed for a week depending on the condition. Egg from the female is taken out which is then fertilized with the sperm of the male and then the embryo is formed. After formation of embryo and its observation in a lab, it is injected into the female uterus. The procedure at the centre is well secured such that the complication rarely comes and the treatment always is successful. IVF procedure India follows the advanced technique which results in the null pain and least invasion. The IVF procedure is comparatively least invasive depending upon the problem faced by the patient for the pregnancy. The doctors and team members at the centre are well-experienced in the field of infertility treatment and had been working at the centre from very early. The reports reflect the feedback of the treatment with the least pain as the proper care and treatment are available. The patients do not need to have more time for the treatment but at least the time demanded by the doctor should be provided. The pain to the patient also varies with the previous record of the IVF treatments. Doctors are guided to follow the best technique of the IVF treatment such that no risk could come to the result of the proceeded treatment. In the procedure, the doctors work in a parallel way with the patient to cope with the pain of the patient. What is the total time taken for the IVF procedure? IVF procedure India is the last option to be taken by the couple to have a child. Infertility can be due to both of the couple. There are many causes which makes the couple infertile in which sometimes it is genetic and sometimes due to the lifestyle of the couple. It is observed that the male infertility is easy to treat. Thus, the couple facing the problem of male infertility should be cheerful for the easiest treatment needed. The time needed for the treatment would be as per the choice of the IVF treatment. There are a number of IVF treatments which is selected by the doctor on the basis of the obstacle for the IVF treatment. Fertility of a female also determines the IVF procedure and the length of the treatment. In the modern time, people are busy with the work and development of their own in which they forget the treatment they need and do not give time in the proper care. Observing these all, doctors settle the treatment in very less time with the best result of the treatment.